In the early 1800's western Michigan consisted of seemingly endless forests, and with the skyrocketing growth of Chicago and Milwaukee, it was inevitable that there would be those who would come to the area to take advantage of the areas bounty. In the 1850's, Charles Mears and Reverend William Ferry were both operating sawmills in the area around Little Sable Point. While almost all of the pine forests had been harvested by the 1880's, there were still plenty of hemlock and hardwoods remaining. O M Poe the Major of Engineers of the Eleventh Lighthouse District wrote to the Lighthouse Board requesting that land for a lighthouse be reserved in the area. Congress appropriated $35,000 for the project, and 39 acres of land were selected on which to construct the new Light station. 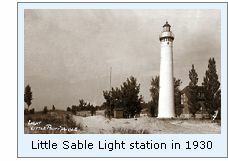 The construction of a light at Little Point Sable was destined to be a daunting task, since the location was distant from any area of supply, and there was a total absence of roads to the site. Work began in April 1873 with the construction of a dock at the beach and temporary housing for the construction crew. A pile driver was towed to the point, and in accordance with Poe's plan, 109 one-foot diameter pilings were driven into the sand to a level nine feet below the surface in order to form a solid base on which to build the tower. Twelve feet of cut stone was then carefully laid atop the pilings to provide a solid base for the tower's brickwork. The brick walls had a thickness of five feet at the base, tapering to a thickness of two feet at its uppermost. With the advent of winter, the crews were removed from the point, and work had to wait for the next spring. The work crews continued the next spring with the installation of the 139 cast iron steps within the tower, and the prefabricated cast iron lantern room and gallery. Finally, the Third Order Fresnel lens was carefully lifted to the lantern room, where it was installed on its cast iron clockwork cabinet and raceway. The lens was rotated through the use of a clockwork mechanism powered by a fifty-pound weight, which was suspended in a vertical slot in the tower wall. A one and a half story brick dwelling rose behind the tower, connected to the tower by means of an enclosed walkway. The first floor of the dwelling contained a living room, kitchen, bedroom and an oil storage room in which the precious fuel for the lamp was stored. The second floor was completely allocated to sleeping areas. A brick lean-to for wood storage attached to the rear of the dwelling and the construction of a brick privy completed the station's structures. Being built of a particularly hard and durable type of brick, the decision was made to leave both the tower and ancillary structures in a natural, unpainted condition, since it was expected they would withstand the rigors of the weather without deterioration. This was no doubt a decision which sat well with Keeper Davenport, as painting was an activity in which the authorities held considerable stock, and he found himself in the enviable position of not having that millstone around his neck every year! With the weather worsening, the crews completed the project, and departed for the final time at the end of the 1873 season, leaving Keeper James Davenport to maintain the station through the winter. With construction complete, it was found that the costs of the project totaled-up to $28,886, saving the Government $6,114 from the original appropriation. Assistant Keeper J. Larky arrived in April of the following year, and the light was exhibited for the first time at the opening of 1874 shipping season. In 1889, a barn was added to the station, and in 1892 a circular 360 gallon oil storage tank was installed. The following year, the keepers built a boat landing and boathouse on the shore. It did not take long before mariners began complaining that the natural brick coloration made the tower difficult to see during daylight hours. As a result, the tower was painted white on September 24, 1900, and thereafter, keepers assigned to the tower would be stuck with the drudgery of the annual painting ritual. In 1902, a trail was opened-up to the area, and wooden boardwalks were installed leading from the trail to the station. With this improvement, it was possible to bring supplies to the station by land. Also in this year, brick oil storage shed was constructed. In 1911, in order to make room for one of the keeper's growing family, dormers were added on both sides of the roof, effectively adding a third floor to the building. In December 1954, with electrical power extended to the station, the kerosene lamp was replaced with a 250-watt electrical lamp within the Fresnel lens. At this time, the rotating mechanism was also removed from the tower, giving the light a new fixed characteristic. With the station unmanned, the Coast Guard began to see the ancillary buildings as a liability, and in the first half of 1955 a crew arrived at the station and demolished everything but the tower. The tower remained in its white painted condition until 1977, when once again seizing the opportunity to reduce the ongoing maintenance costs associated with constant painting, a crew arrived at the station, and sandblasted the tower. Once again, James Davenport's easy ride was exposed to the light of day! The 39 acres of the original station are now part of the Silver Lake State Park, and a paved parking lot has been constructed a short distance behind the dunes, giving bathers a close path to the beach. In early December 2005, the Big Sable Point Light Keepers Association signed a twenty-five year lease on the tower, and the group began rehabilitation in the spring of 2006. The tower ill be open to the public from 10.00 AM to 6.00 PM every Friday through Monday from the first weekend in June through the end of August. 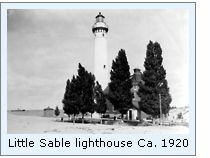 Click Here to see a complete listing of all Little Sable Point Light keepers compiled by Phyllis L. Tag of Great Lakes Lighthouse Research. Take Silver Lake Road South out of Silver Lake. Near the Lake, the road turns to the West and the road surface changes to gravel. Continue on this gravel road approximately 1/2 mile to the lighthouse parking area. Climb over the dune, and the tower is on the beach on the Lake side of the dune. Inventory of Historic Light Stations, National Parks Service 1994 . Historical image from USCG Historians office, Photographic archives.